This is great for lovers of scary stories. These are true accounts of real incidents that happened to real people. I enjoyed listening to them. A few of my favorites are the haunted house stories and especially the ones titled 'The Gravediggers', 'The Voices Under the Stairwell', 'Night of the Full Moon', and 'Maude Crawford'. I liked the chapter about dreams also. The book is divided into sections; guardian angels, the paranormal, the unexplained, dreams, premonitions, psychic experiences, the bizarre, and legends. ALL good. Every chapter was good but the bizarre was indeed bizarre and the legends were definitely chill worthy. While I really enjoyed this audiobook, I wish it had been a little longer with more stories. Also, the stories took place in Texas, Arkansas, Oklahoma, and Kansas. About the narrator: SHAUN TOOLE did a terrific job reading this audiobook. He has great tone and speaks clearly with the right voice inflections for the book. Overall, his style made this a super listen for me. Great work for both him and the author LaVonna Moore. Fascinating stories- read with intensity! Yes. The stories really give you something to think about. What was one of the most memorable moments of The Unusual, Unknown & Unexplained? The story of the young man with the near death experience. What about Shaun Toole’s performance did you like? He made the stories come to life for me. Excellent narrator. Look forward to seeing more of these! I THOUGHT THIS BOOK WAS AWESOME! This was a spine-tingling exploration of the unexplained and mysterious events. This book was scary to me. Ms. Moore is a new and very exciting writer. Her characters come to life and jump right off the pages and grab you! I can't wait to order the second book in the series. The chapter on Miracle and Near-Death Experiences was heart-warming and life-affirming. This was my favorite chapter of the book. I thoroughly enjoyed this book! The book kept my attention and I couldn't hardly wait to read the next exciting story. My favorite chapter in this book was Miracle and Near-Death Experiences. It was an excellent read. Quite the variety of stories! This book is a collection of over 70 short accounts of the bizarre and unexplained. It covers a variety of paranormal events such as angels, after life experiences, and ghosts. This was an interesting account of various unexplained experiences. The variety was such that I never got bored with the book. While I felt some of the accounts could possibly be explained easily with coincidence or pranks, it was still good fodder for the imagination. I think this would be a useful little resource for authors wanting inspiration for a paranormal aspect to their writings. What I found most interesting were the reactions of the humans involved – did they believe immediately? Were they skeptical? If so, what changed their minds? Some of the ghost stories do have little advertisements for the haunted house turned bed & breakfast. For me, this diminished the validity of the story. But that is a small complaint and shouldn’t deter anyone who is interested in this subject. Narration: Shaun Toole did a decent job. The stories were so short that at times they blended into one another. Toole didn’t employ any particular voice distinctions for the various stories, instead choosing to read out the stories in a clear voice. I can see how it would be difficult to come up with different voices for each story, especially since few of the stories gave any hint of where they were located. Short unusual stories. Unknown to must of us and some of them unexplained, some are just miracles. As I was listening to each story I reminded myself of how short life can be and how gifted we are. Now more often, as years go by I do realize: live life like there's no tomorrow, cherish every moment with others around you and be happy with what life entails for you! There are many things in life that are not fair. Sometimes we get out of our path, but we got to keep going, this is only the beginning. The author did some research, but feels like a documentary, not very appealing for every public. Shaun Toole, the narrator did help me deal with the subject, he was very good! "Once I died, and then I didn't"-stories, very repetitive. If you enjoy stories about near death experiences - this is the book. With not a small amount of religion sprinkled on top. Shaun Toole's narration kept me listening. 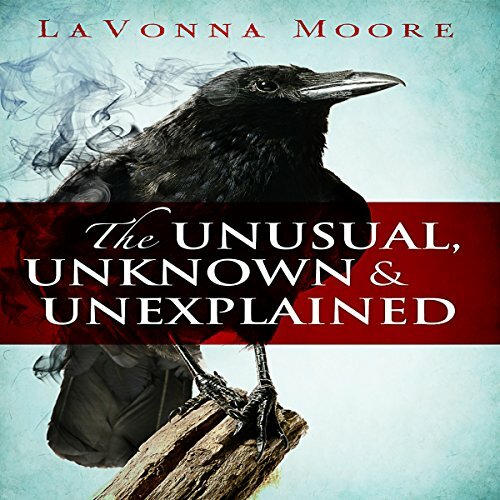 What did you like best about The Unusual, Unknown & Unexplained? What did you like least? The narration redeems this book. While some of the stories in this book were intriguing, the writing was amateurish. However, I kept listening because of the voice in my ear. I look forward to hearing more of Shaun Toole! What a waste of time...it sounds like a breathless 10 year old came up with these stories. Do yourself a favor and skip this book.